I'm here, but totally busy in a good way with returned husband and visiting friend. Pics will follow at some point soon! Well, as of right now, David's rebooked onto a flight that lands tomorrow afternoon. Heathrow cancelled 20% of flights today and who knows how well things will be running tomorrow? We shall see. We have the ride lined up for him, and he hopes to be home by dinnertime. Me, I will be hitting the road around 2:30 AM here with kids and their pillows, to head to Gatwick to meet Susie's 6 AM flight tomorrow morning. Directions are downloaded, car is gassed up and cleared out, guest room is ready, and the rest of the house is its usual self. Which is to say, pretty tidy, actually. I'll be hitting the hay very early tonight, so I can be a spunky, sparky driver on the M25 in those pre-dawn hours. Wheeeee!! So. David is due to fly into Heathrow's new Terminal 5 tomorrow night at 10:15. We've booked a car service pick-up so I don't have to schlep the kids to the airport in the middle of the night. Susie is due in just before 6 AM at Gatwick (other side of London) on Saturday morning. This means D. will arrive home around 2 AM, and I will leave around 2:30 to head to Gatwick. Yeah. Crazy welcome home, but we had it planned out, and it will all work. At least....we THOUGHT it would. Duh duh DUH. Did anyone see the monkey wrench in that last paragraph? If you guessed Terminal 5, you win the prize. The brand spanking new international terminal at Heathrow opened today in utter chaos. Apparently, their spandy new baggage-handling system is completely nonfunctioning. Arriving passengers are waiting up to 2.5 hours for the bags. As of 5 this evening, departing passengers are not even allowed to check any baggage. 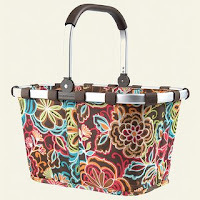 It's carry-on only, or go find another way to get where you are going. They promise things will be smoothed out "really soon" but meanwhile, we're all prepared for probable major delays. That'll mean David getting home Heaven knows when, me taking off 15 minutes after Heaven knows when, and Susie cooling her jets at Gatwick for a possible good long time. There's the domino effect. Good thing she's got her tunes and her knitting and her cheerful outlook on life to keep her company. Right, Susie? How did I forget to mention this?! That's right, 6 September in London it's "I Knit Day," starring the Yarn Harlot and workshops and vendors and knitters galore. I have my ticket, and I'm ever so very excited about it. Anyone else here in the UK going? In other news, my head cold is heading (heh heh...) south to my chest. I'm now starting to sport a lovely cough. Hoping to nip it in the bud with positive thinking and vitamins, and an early night tonight. Today we headed to the Dinosaur Adventure Park with some friends. It was a wonderful day out, although it was mighty cold. The silver lining there is that not many other people thought it was a good day to play outside, so we had the park pretty much to ourselves. The mini-golf, the go-karts, the dinosaur trail, the maze, trampolines, basket swings, giant climbing dinosaur, and all the climbing gear, all of it was ours for the playing. The kids ran around nonstop for about 5 hours, and boy am I tired! How does that work? One more thing, before I amble back to bed. This slideshow from the Washington Post is utterly fantastic. Whether you love or hate the lowly Peep, the creativity of the people who did these dioramas is worthy of admiration. Some are not entirely appropriate for kids' viewing, but all are great!! I'b got a code id by head. Many thanks to Lily, who always manages to bring home a bug on the last day or two of term. She's feeling sparky now, if a little stuffy, but I have been producing way too much oogy stuff and using way too many tissues. I even took a nap in the middle of the day. With two kids home. And no other grownup around. I told them to play quietly and come get me if they needed anything. After the second story that Lily asked me to make up for her book she drew, I invited her to nap with me. That got her back downstairs in a hurry! The house didn't burn down, and I managed to survive the rest of the day until bedtime, so that rocks. Here's to Twinings' Lemon and Ginger Infusion, or whatever it's called. Perfect for stuffy heads. Check out the family website (usually sadly neglected) for some terrific Easter pictures. May you have a wonderful Easter, wherever you are, Gentle Readers! I had to share this picture I took today, during our crazy weather. Check out the difference from the summery photo that titles the blog. The kids were highly miffed that the hail was not snow, but they did venture out to pick up some bowls of it to do experiments. Aren't we glad I found the camera? Come on, now..you know you are. Maybe I will even wait a few hours before posting MORE pictures! Check out the finished eggs...Grandma Doe told us how to get stripes of non-colored area using rubber bands. Came out really well. I wish we'd done more of them that way, but all the eggs are nicely gaudy. Just right for tomorrow's egg hunt! Aren't we lucky? Now I can inundate you with knits, and later on, with Easter egg coloring pictures. It's a very strange sort of day, weatherwise, with lots of wind and hail/snow/rain alternating. Nothing's sticking, but it's really miserably cold outside. OK, for full deets on the Big Booga Bag, see my projects on http://www.ravelry.com/ (I'm susieknits there). If you're not a Raveller, but you're DYING to know the yarns, stitch count, etc, just comment and I will dig it all out for ya. It's going to be a largish tote once felted, I hope. Here's a shot from the first couple of days of knitting, and then one from this morning. You can't really see it, but I carried a strand of olive yarn along with the multi yarn for the bottom half, and I've just switched to a double strand of the mult in the last 20 rows or so. This should make the top half brighter, while still toning with the bottom bit. ...and I've Never Been to Boston in the Fall!!! 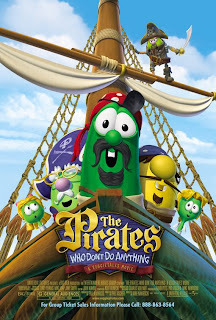 Today, I took the kiddoes to see The Pirates Who Don't Do Anything, a full-length movie very vaguely inspired by this Silly Song from Veggie Tales. it was a very cute movie, and the kids thought it was awesome. Me, I preferred the first VT movie, Jonah, but I liked this one too. Oh, and my niece, Clarke? She is a most clever lady, and even getting kudos to reflect that at school. Cheering wildly from here. That's all from me today. No posting of my deeper thoughts or current worries about friends, etc. I'll keep those for my own, and just say to you, Gentle Reader, have a wonderful Easter weekend! The kids finished up the winter term today, and highly enjoyed their Easter Disco (a fundraiser) this evening. Children's discos in the UK are an interesting phenomenon. There's music, and dancing around, but really the DJ is the games ringleader. The first 90 minutes was for the 4-7-year-old set; the last half was for the 7-11 crowd. Lucky me, I got to be there for both, with one child in each camp. Fortunately, the other two small children who stayed for round two were friends of Lily's so they played happily in a corner of the hall. We were all whipped when we got home, and I hope against hope that the kids will sleep in tomorrow. If you like space stuff, then this site (Google Mars) is absolutely astounding. Check out the detail on these maps. I brought the Booga Bag along tonight, and knit a little bit. It's really going quickly, but I can't find the freaking camera to take progress pictures. I have absolutely no idea where I stashed it, which is very frustrating indeed. 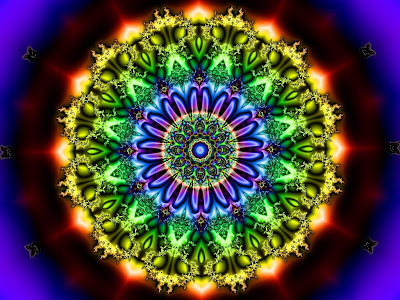 Isn't this an amazing mandala? It's like fractals and stained glass. (The image is from this site.) I've put this picture up as wallpaper on my laptop, for use as a focal point during meditation and prayer. Today's been a very quiet sort of day - Lily spiked a little fever so both of us hung out at home today. By this afternoon, she was feeling pretty sparky again, so I am hoping she'll be up for school in the morning. I have been making some serious progress on the Booga Bag. I'm using lots of stash yarn to extend the multicoloured wool I have, and I think it's going to be a pretty cool bag. I'm going big, and with luck, after felting, this will be a good-sized tote. So far I have about 10 inches of the body done. It will be at least 20 inches deep pre-felting. I haven't decided how much bigger than that, though. The best thing about this project: miles of mindless stockinette on large needles. How is that good, you ask? Well, it makes for great TV-watching time. I'm combining my knitting with watching The Palace on my laptop, and it's a match made in heaven. This is an ITV show that just aired in the last two months. Imagine a combination of The West Wing and Dallas or Dynasty. Great stuff! All eight episodes are still available online , for another two weeks, if you live in the UK. Or you can buy the UK DVD already - who knew? I've got nuthin' of great import today for you. Visited the dermatologist today for a close look at some moles on the Small D-man. One will be removed and biopsied next week - "These look fine! Except this one's kinda rough, and big, and weird-shaped. Let's take it off and have a look. It's fine! [Hearty laughter.]" A little nervous-making, but not too bad. OK, sort of stressful to think about, actually. Lily Bean had another friend over tonight, for the first time, and it was a great success. Kids are asleep, I'm fried and avoiding kitchen clean-up, and this lace-weight wool is pretty drool-worthy. Such lovely colours. See, I told you it was Odds and Ends, gentle reader! Just wait until the Go Fug Yourself ladies get a load of this article. Our Miss Leggings-Lohan is going to be a designer. Of leggings. Imagine!! 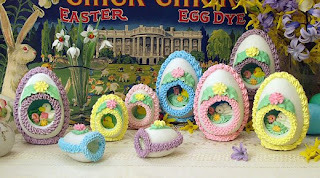 When I was really little, there were at least two years, maybe more, that we had these eggs at Easter. In my memory, they were the most intricate things, with a little world inside each egg. Later, as an adult, I loved looking at the Faberge eggs in the Walters Art Gallery in Baltimore. They reminded me of the sugar eggs, done on an incredibly luxurious scale. I wonder if I can find a couple of these here, for the kids' Easter baskets? You can't go home again, but I'd love to pass on that memory of amazement to them. The picture comes from this website. Cool stuff! On what planet is this man?? I've had a lovely morning all to myself, with no commitments, unexpectedly, and it's a nice feeling. The one-row scarf? She is DONE!! I took a few pictures to post on Ravelry but it doesn't look any different from the scarf-in-progress shots last month. Just longer. I used two skeins of Wendy Fusion and size 6 needles. Loved the color changes in the yarn and grew VERY tired of the pattern before the end. That's just me struggling with project monogamy, however. I think the finished scarf is quite classy looking. Now, on to a new project (skipping wildly around room). 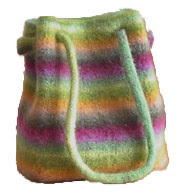 Looking at the wool I have set aside for the felted bag project, I realized that I haven't got enough for a French Market Bag, but I could make a Booga Bag (picture below is from designer's web site). I like this handle style a bit better, anyway. I think I will try to make it somewhat bigger than the finished bag as written. Several people on Ravelry have made modifications to get a bigger bag. I'm going to use tweed-flecked black wool from my stash (Tivoli Tweed DK, I think) for the base, to get more mileage out of the multicolored wool I have. Pictures of my own bag-in-progress will follow soon as there's enough to photograph. Remember my drooling post? Guess whose lovely, lovely, wonderful husband has ordered one of these as a belated birthday gift? (He was in the desert for my birthday.) I love that man. Can't wait to see how much bouncier my hair looks, and how much knitting I will finish, and how well I can bake bread once it's in my hands. Heh. ...TOO quiet. No, not really. I don't think there is such a thing as "too quiet. "However, Lily is at a friend's house for play and teatime, so it's just the Younger David and me. We don't make a lot of noise, I'm finding. Heh. I'm kind of liking that. We'll also seize the day and have pesto with our ravioli, like crazy gourmet people who eat sauces on their pasta. So, I missed two weeks of class because of various kiddie medical appointments, and returned last week. We started our Giverny Garden pictures then, and finished them off this week. A little bit of a change from Week One, that's certain. I've signed up for the next class, which begins in mid-April, and am really looking forward to it. I've learned so much. Sometimes it feels intuitive, and sometimes it's really difficult to grasp why something works in paint the way it does, but all the time, I love it! 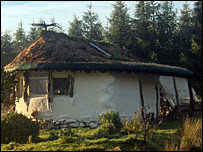 Check out this article - a man in Scotland built this house for 4,000 pounds, or about 8,000 dollars. More pictures of the building process are here. Mom loved reading about homesteading, straw bale houses, log cabins, and inexpensive/ecological housing in general. We call little teensy houses "Grandma Houses" in our family. This is definitely a Grandma House. I think I didn't blog yesterday (cue ominous music). That's because I was deeply dull. Today is really blustery, wet, windy and awful. It's the sort of day when something like this post about bread baking looks deeply appealing. I made a batter bread a couple of weeks ago that was great for instant gratification, but there's something richer and more satisfying about a yeasty loaf. David's Uncle Walter passed away today. He had been in poor health for quite a while, but took a really bad turn for the worse these past two weeks, truly struggling for every breath. Walter was a lovely man, I was glad to know him, and I am glad he is not suffering any longer. Not much excitement around here today, just a dental appointment for Lily (x-rays and cleaning), massive amounts of laundry in the big machines on base, and random errand-running. I'm feeling a tad sleep-deprived this week so I will be heading to bed early. I know the clocks jump ahead in the states this weekend, but not until March 30th in the UK (just had to look that up). You've probably seen the video (hilarious) where the cat wants to wake up its owner. Apparently, the animator has made another one. Watch kitty plead to be let in. I know this cat. I've lived with this cat. Heh. Thanks to Glenna of Knitting to Stay Sane for leading me to that chuckle. That's the Glenna who designed Ivy for Knitty and Basic Black for MagKnits - she totally rocks. Why, yes...this post IS very linkalicious. Thank yew. Today I got my hair cut. It looks fantabulous, if I do say so myself. However, documentary proof? Not so easy. I tried the ole Mirror Shot trick and the flash went crazy, but when I chose "no flash" I could NOT get a non-blurry shot. I guess I have shaky hands. I had small D take a few pictures but those too were blurry. I'll have to try in broad daylight with the mirror, but trust me. It's a good haircut. We got rigd of the shag in the back, and the stylist gave me a modified bob with lots of layers in it. Very grown-up looking, and short without looking "short." If you read yesterday's post, and Susie's comment, she's referring to the best thing to come my way in a long time. I will be baptized soon, and David and Susie will both be there to witness the day. How wonderful is THAT?! Very, actually. I've been attending church locally, and the more I learn, the more I pray, the happier I am to be there. I feel a centering in my life that I have longed for, and I am truly grateful for that, more than anything else, today. Thankful for my sweetie husband, and the fact that he found a phone that will take a phone card so we could talk, and listen, to one another more than 5 minutes without fear of bankruptcy. Thankful for Twining's fruity something or other tea, which is totally pink and quite tasty. Thankful for Aleve and how it made my tooth/headache go away. Thankful that one of my picky children has expanded the foods he eats to include pesto and olives, so two of the three of us ate something colorful for dinner tonight. Thankful for good news from my mother-in-law, about David's uncle, who's been quite ill.
Thankful for my mother-in-law, who loves me maybe as much as I love her! Thankful that I have a haircut appointment Wednesday so I will be able to see through this shaggy mane. I'm definitely going shorter this time. Thankful for audio available on line so I can "read" and knit at the same time. And thankful for you, Gentle Reader, for bothering to read my blathering. Today is Mothering Sunday here in England, or, as I like to think of it, my extra Mother's Day. I was gifted with handmade cards from both kiddoes, a lovely cake from small D decorated with every sort of chocolate known to man (because D's teacher? She is brilliant and knows what mothers love. ), and even little flower corsages. I am so lucky. Maybe the nicest thing was the 2-hour nap the kids let me take this afternoon while they played nicely together. Not maybe. Definitely the nicest thing. On the other hand, it was also fun putting together David's planetarium despite the forty-eleven tabs that needed to be glued. It took us hours to get that thing into a globe shape, but it was gratifying in the end. If you're a mother, you have a virtual hug from me today. I hope your day is/was lovely. Do any of you have that tradition? On the first of the month, as soon as you wake up, you should say "rabbit rabbit rabbit" for good luck. I think it was my fourth grade teacher who told me that one. The kids find it amusing, though. Knitting - some progress. I moved the eternal one-row scarf into my purse this afternoon, when I drove David to a birthday party. But I didn't actually do any knitting.